44.001 Twenty-plume Moth eggs and newly hatched larva on Honeysuckle flower buds in the garden, May 15th 2012. 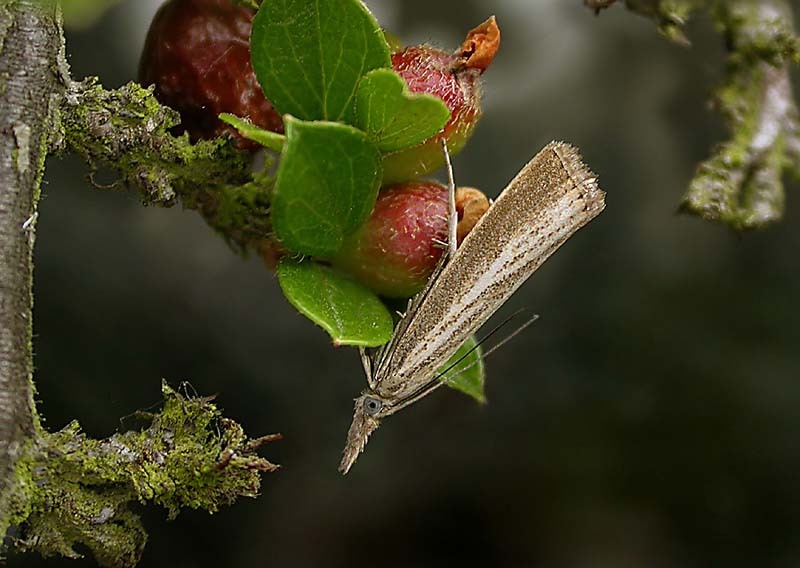 I expect the majority of Honeysuckle in gardens host this species. 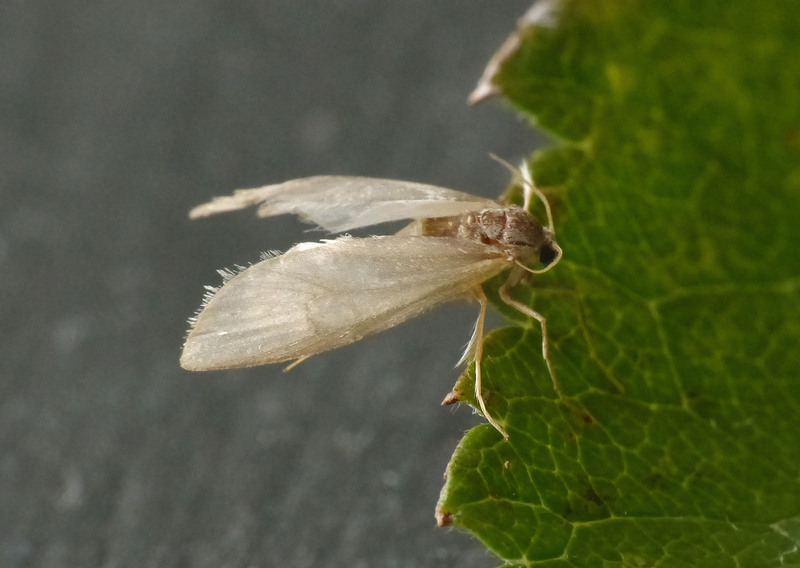 44.001 Twenty-plume Moth, in the garage, May 15th 2014. Captured by day. 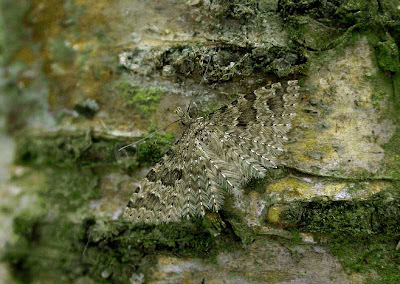 44.001 Twenty-plume Moth, the garden, Mar.20th 05. Captured by day. 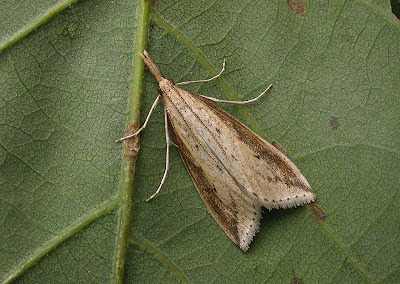 44.001 Twenty-plume Moth, the garden, May 3rd 06. 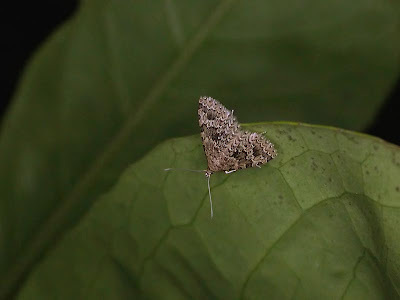 Photographed at dusk. 63.080 Garden Grass-veneer (Chrysoteuchia culmella), Robber Dodge wood, Stainland, July 7th 2017. A field observation. 63.080 Garden Grass-veneer (Chrysoteuchia culmella), at the former sewage works at West Vale, June 30th 06. A field observation. 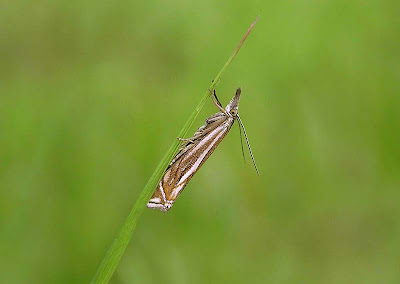 A common grass moth which is easily disturbed by day. 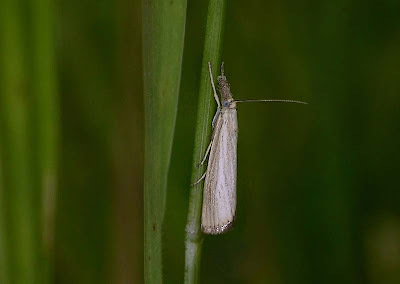 63.080 Garden Grass-veneer (Chrysoteuchia culmella), - light form at the former sewage works at West Vale, July 2nd 06. 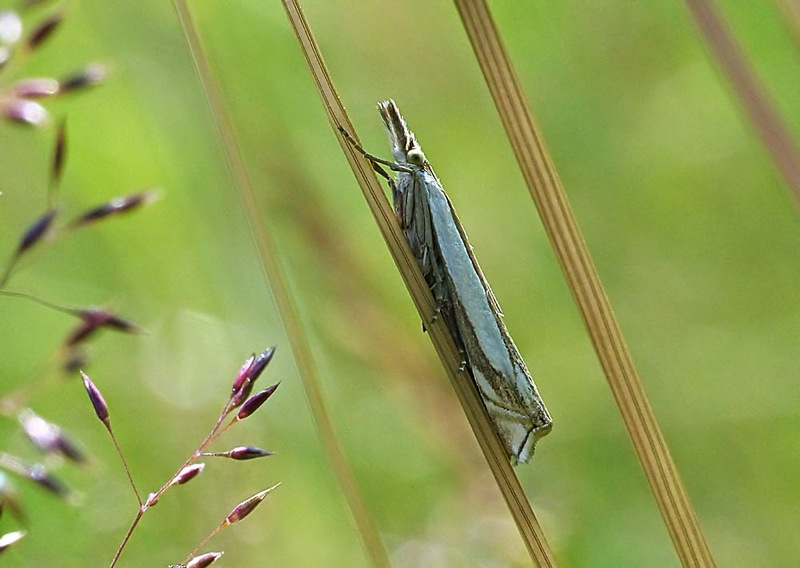 A field observation. 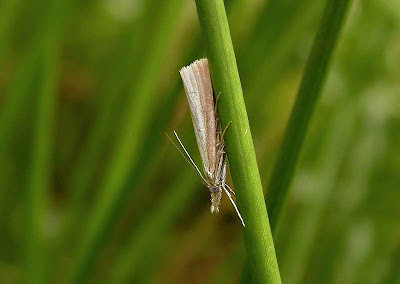 63.081 Inlaid Grass-veneer (Crambus pascuella), Tag Loop, June 30th 2014. A field observation. 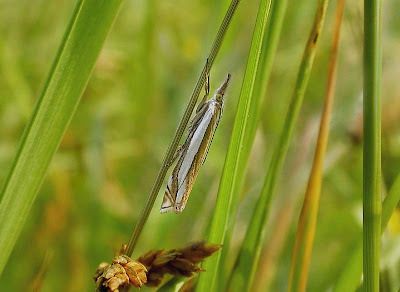 63.081 Inlaid Grass-veneer (Crambus pascuella) at Tag Loop, July 3rd 06. A field observation. 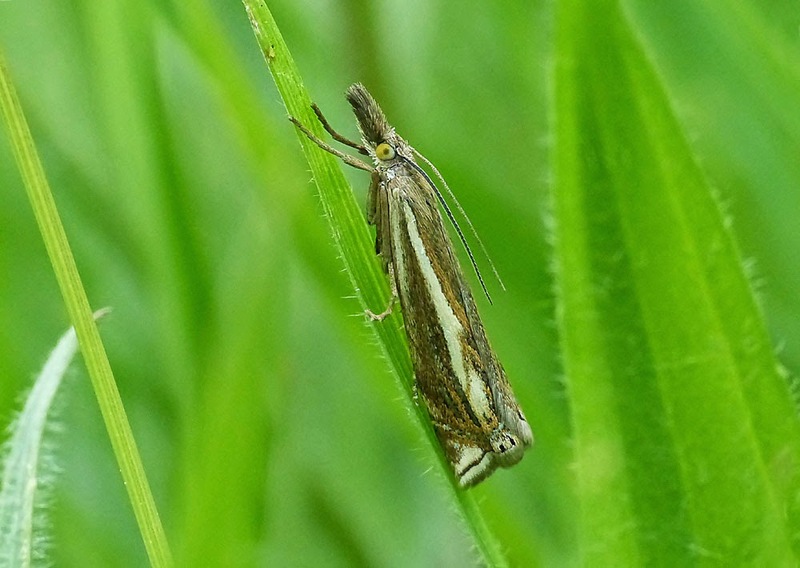 63.086 Hook-streak Grass-veneer (Crambus lathoniellus) at Mathew Laithe near Lobb Mill, May 31st 2014. A field observation. 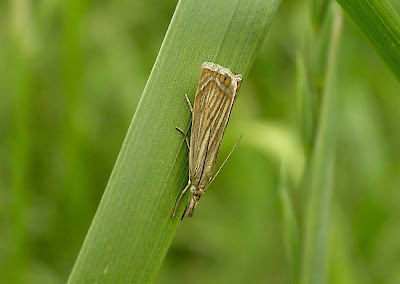 63.086 Hook-streak Grass-veneer (Crambus lathoniellus) at North Dean meadow, June 14th 06. A field observation. 63.093 Straw Grass-veneer (Agriphila straminella) - male at Callis flood plane, Hebden Bridge, Aug.4th 05. A field observation. 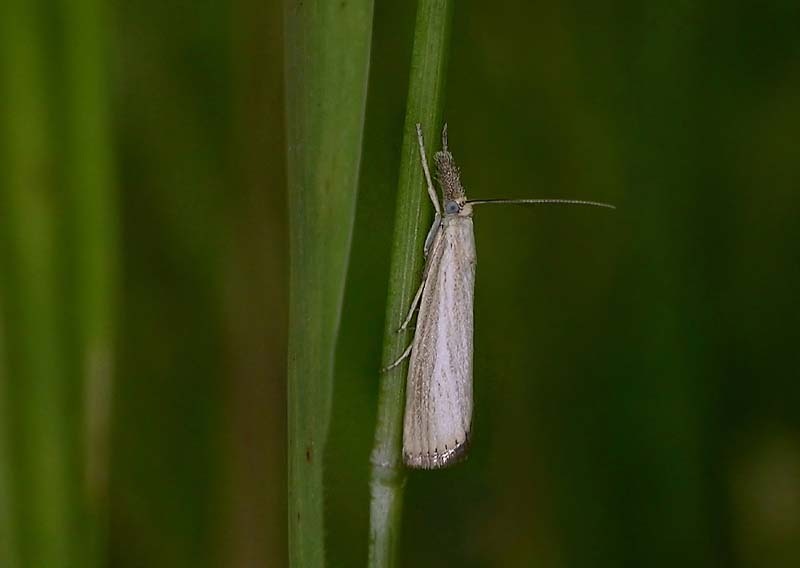 63.093 Straw Grass-veneer (Agriphila straminella) - male at Copley meadow, July 5th 2017. 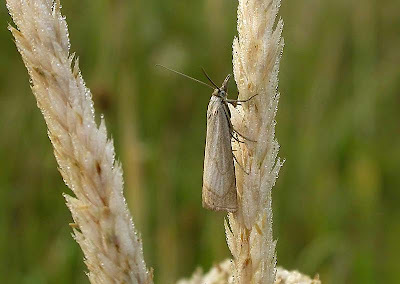 63.093 Straw Grass-veneer (Agriphila straminella) - female at the old sewage works at West Vale, July 7th 06. A field observation. 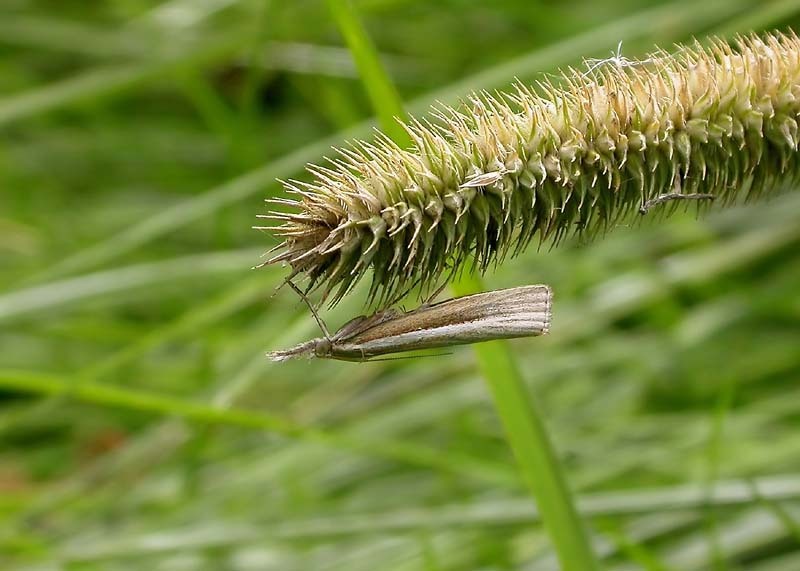 63.089 Common Grass-veneer (Agriphila tristella) in the garden, July 4th 09. 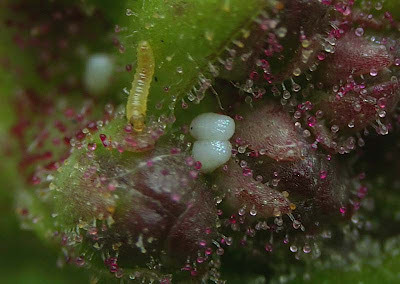 A field observation on Cotoneaster. 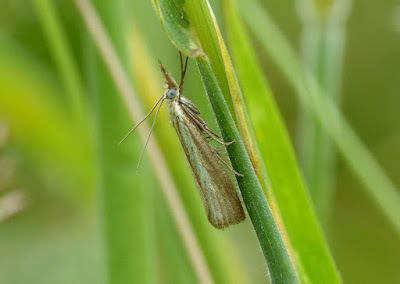 Perhaps the most abundant of grass moths in Calderdale, very common and easily disturbed by day. 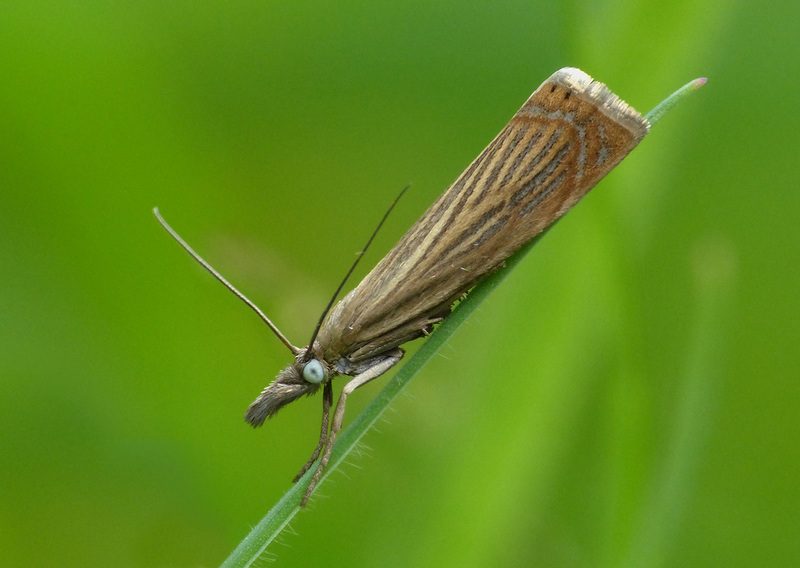 63.089 Common Grass-veneer (Agriphila tristella) at Callis flood plane, Hebden Bridge, Aug.8th 05. A field observation on a grass sp. 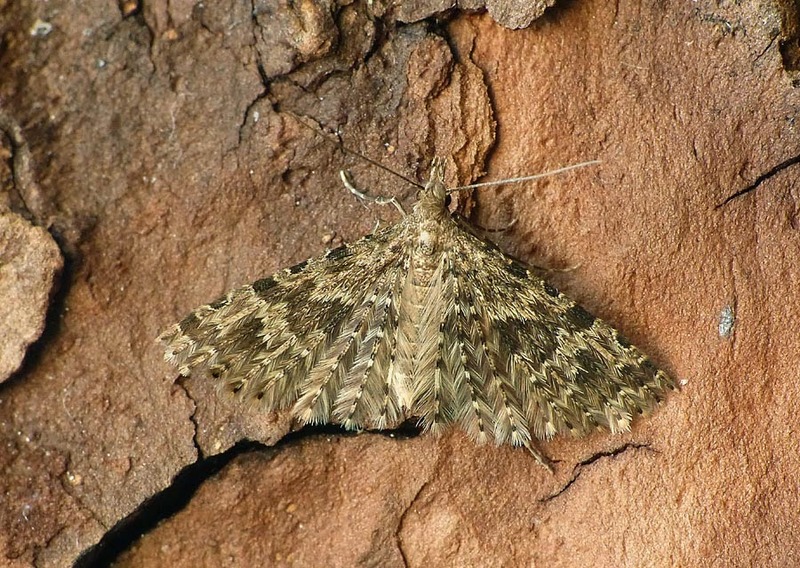 63.115 Water Veneer to an actinic trap at the Warden's Cottage, Hardcastle Craggs, July 21st 2017. The larvae feed on submerged pondweeds to a depth of up to two meters and the adult females are aquatic, coming to the surface to mate with the winged males. 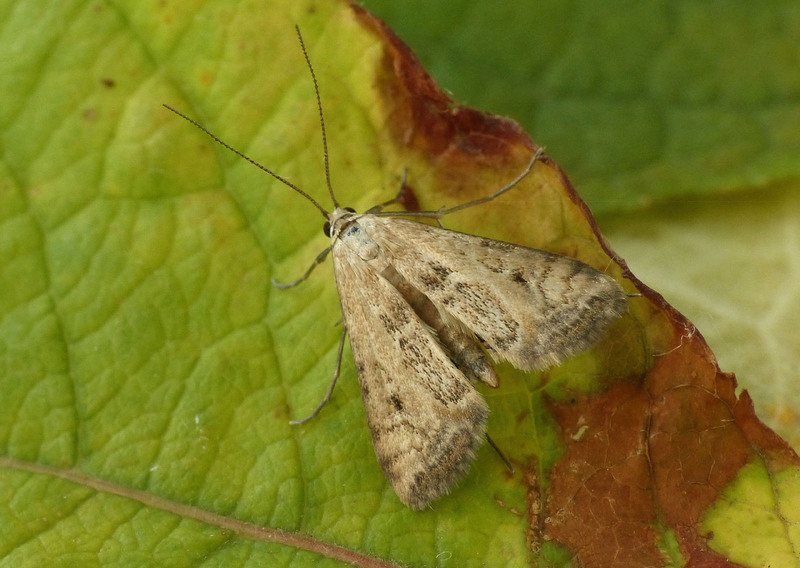 63.116 Small China-mark - male, one of several of both sexes to MV light at the cabin, Cromwell Bottom, Aug. 3rd 2018. It would be interesting to find out if they came from the near by wheel wash ponds. There are small patches of duckweed growing so it definitely merits further investigation. 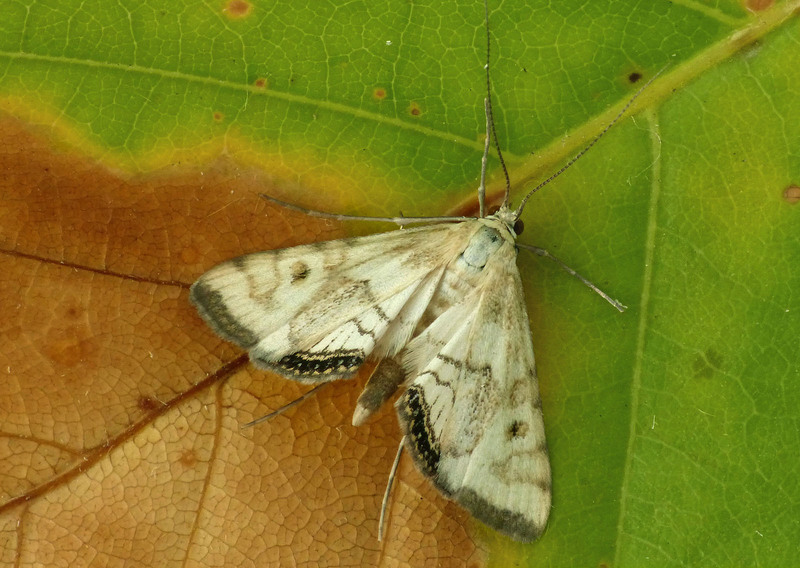 63.116 Small China-mark - female, on the same date as the male pictured above. 63.121 Pale Water-veneer (Donacaula forficella) - male by the towpath at Elland Bridge, Aug.1st 2012. Captured by day. My only other record is of one netted at dusk at Blake Dean on June 7th 08. 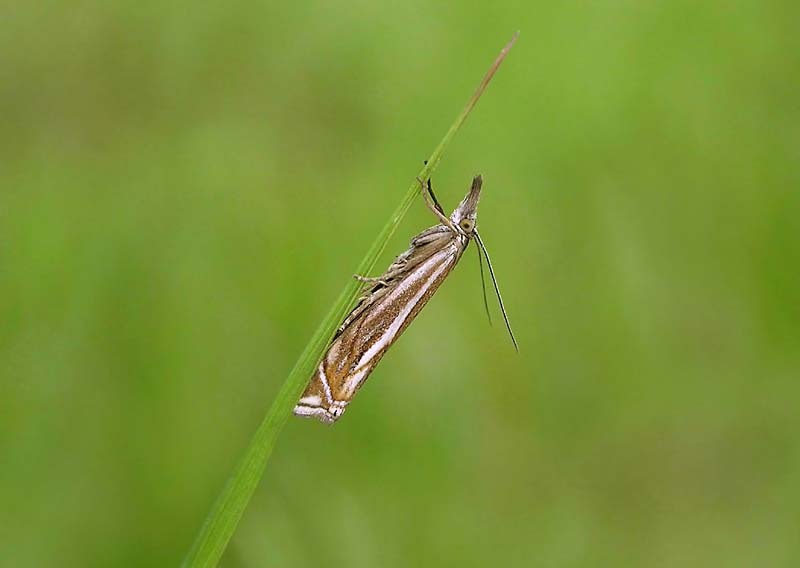 The larvae feed on reeds and sedges in marshy areas and when a new food plant is needed it cuts away part of the reed that it's feeding on to use as a raft.